In White Eagle, powerful forces are struggling to control a nation. The armed might of King Julian of Silesia is matched against the equally powerful economic force of the free city of Krakow. Opposing them both is the Wojsko Ludowa (People's Army) of Father W. Niekarz, whose only weapons are a deep patriotism and the Black Madonna of Czestochowa, a religious icon and a powerful symbol of Polish nationalism. Surrounded by a sea of bandits, marauders, homeless soldiers from a halfdozen nations, and an increasingly hostile environment, these three groups are engaged in a struggle that will determine the future of Poland-that will decide whetherthe country will begin a long, slow recovery, or rapidly sink into a mire of chaos. The characters hold the key to victory in that struggle. 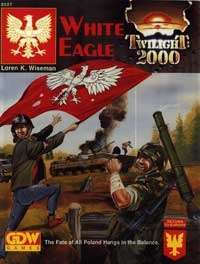 White Eagle serves as both a sourcebook of southern Poland in the early 21st century and as an adventure (or series of adventures) taking place there. White Eagle outlines what has happened in southern Poland since the players last saw the region: the transmutation of General Julian Filipowicz into the despotic King Julian, the power struggle within Krakow for control of the region's industrial economy, and the deteriorating agricultural situation that threatens to spark another round of civil unrest within the towns and villages of Poland. These and other factors that threaten the fragile blossom of civilization are outlined and described. The characters could be called upon to undertake a diplomatic mission into the city of Krakow, which is not as safe as it once was, especially when you consider that the Characters' mission will effectively bring down the present ruler, who will not be in favor of their actions. The characters may be sent to Silesia to spy on the army being raised there and thus fall afoul of the self-proclaimed king of Silesia (soon of Poland, if he has his way). The characters may be called upon to train the inexperienced peasants of the Wojsko Ludowa and turn them into an effective fighting force-and then to lead that force into battle. On the other hand, the'characters may choose not to help the Wojsko Ludowa and instead take employment in Silesiaor Krakow.